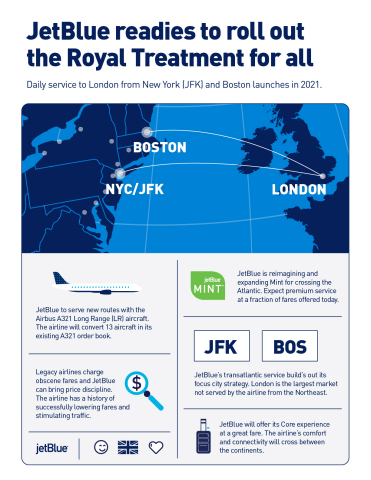 NEW YORK--(BUSINESS WIRE)--JetBlue (NASDAQ: JBLU), New York’s Hometown Airline® and the largest airline in Boston, today announced it intends to launch multiple daily flights from both cities to London in 2021 (a) – the carrier’s first European destination. The new routes, which will be served by Airbus A321LR single-aisle aircraft with a reimagined version of Mint, will mark the first-ever transatlantic service offered by the award-winning airline. JetBlue is evaluating which London airports it will serve.